When it comes to planning for retirement and other goals, advisors often hear about taking advantage of a client's "peak earning years." Rarely, however, do you hear about the "peak debt years," which typically arrive in a client's 30s. At this stage of life, debt combined with dependents creates significant and often unmet risk management needs.The 32-year-old with two kids, a mortgage, student loans, and 529 and 401(k) plans to fund faces a host of obligations contingent on his or her ability to earn an income. From an insurance standpoint, the value of the client's life is at its peak, yet he or she may have little to no coverage. These clients need more life insurance, and you could be their only hope of getting it. Clients' evolving coverage needs can be illustrated with two arcs, as shown in the image below. The larger arc rises with increasing responsibilities to home, family, and business as the client proceeds through life. As the client nears retirement, a second, smaller arc rises, representing the potential desire to leave a legacy through wealth transfer. At the peak of the first arc, studies have shown that clients are woefully underinsured. They may realize that they need coverage, but they also need a nudge in the right direction. Even for those who do own life insurance, the average amount of coverage is only $152,000, offering just a few years of income replacement at most. 43 percent of married mothers lack life insurance, compared with 34 percent of married fathers. Add to this the fact that more than 25 percent of U.S. households say they need more life insurance (according to LIMRA's 2014 Insurance Barometer Study), and you have a population with substantial and potentially disastrous risk. If you work primarily with pre-retirees and retirees on the other side of the arc, it's easy to dismiss these risk management needs. It's not your problem—these aren't your clients. But think about it: who will these exposed millennials and Gen Xers depend on if they lose an income? Just as it was when they moved back home after college, they are likely going to look to Mom and Dad—who are your clients—for help. From there, you need to know about any health issues the client has—simply asking what medications he or she takes can be an easy way to find out. Then, simply put together a proposal. There are several carriers that will write up to $250,000 without paramedical exams, with some carriers offering a face amount even higher than that. "How much do you want?" In a sponsor session at Commonwealth's National Conference, Penn Mutual's Allan Sternberg talked about the value of insuring clients for the most they can get. 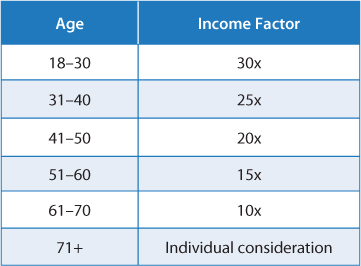 Throughout his career, Sternberg has relied on the following table, which shows the amount of coverage a client can get as a multiple of income at each age. His message to clients is straightforward: "Here's how much you can get; how much do you want?" Sternberg also relayed a personal story that drove his point home. While he was on a flight, an alarm rang out, the cabin filled with smoke, and the pilots began preparing for an emergency landing. After making what could have been his final phone call home, Sternberg shared, he felt at peace knowing that, no matter what happened, his family would be taken care of because he'd maxed out his life insurance coverage. "Peace of mind" is the ultimate goal of many financial planning activities. Yet the variability of results (particularly when there's a long time horizon involved) prevents a true feeling of security. When it comes to meeting risk management needs, however, you can make a real promise to your clients and their families, locking in security if the worst happens. Remember, it's during their peak debt years when your clients need you most. 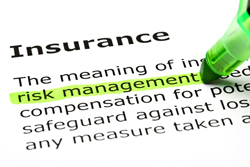 How do you handle risk management needs for younger clients? Is term a reliable solution? What other options do you consider? Share your thoughts with us below.